With market conditions extremely thin today on account of that monster storm churning up along the Eastern seaboard, it is tricky trying to read too much into one day's price action. That being said, it does seem that traders are leery of putting on too large of a position one week out from a critical election. I know that the silver bulls are making a big deal out of the apparent lack of liquidation from the speculative side of the market; however, this is in truth a double-edged sword. I would have preferred to see a more sizeable flush with the market holding above critical support near the $31.50 level as that would have set the market in a healthier position to break to the upside. These stubborn bulls will flee in size IF, and I want to emphasize the "IF" part of this, support marked "INITIAL SUPPORT" does give way. There is a tremendous amount of firepower available to the shorts should this level fail as the forced selling would easier and quite quickly, I might add, would take the price down to support near $31.25 down to $31 before we would see some value-based buyers put their toes into the water. 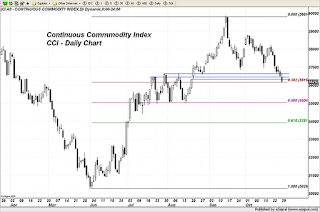 The way I see this, as long as the CCI, the Continuous Commodity Index, is headed lower, silver is going to face strong opposition to any sustained uphill climb. The grey metal needs an INFLATIONARY environment in which to thrive and without the CCI confirming one in the commodity sector, rallies into resistance are going to be met with strong selling. Once the CCI turns and breaks out to the upside, so too will silver. But until that time, it is likely to remain rangebound with pressure coming from risk aversion trades and buying coming from those looking further out along the horizon to an expected outbreak of inflation in the future. 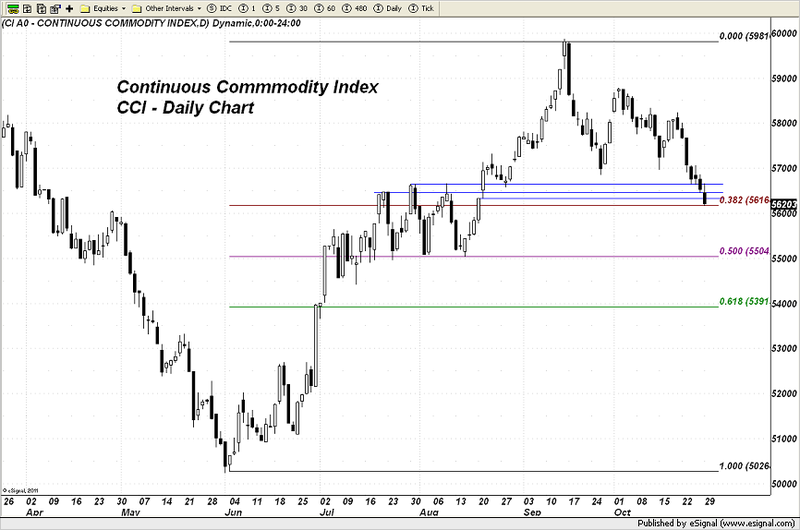 Note on the following chart the breakdown in the CCI. 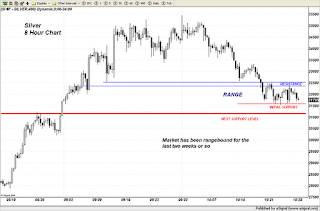 It today has moved down to the 38.2% Fibonacci retracement level of the entire rally off the June low. 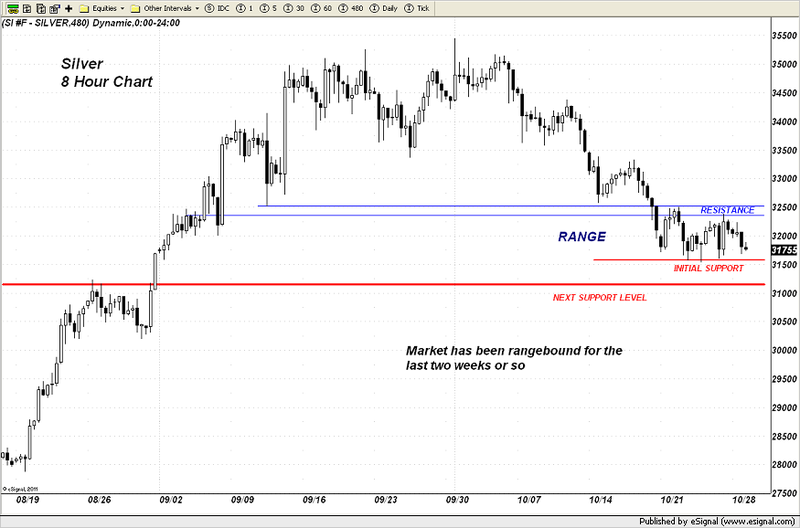 Failure to garner support here and bounce higher will set the market up for a fall down to 550. Should this occur, silver will likely break chart support and move to $31 and lower. We will need to see the CCI move back through 580-585 to see silver have a real shot at an upside breakout. One thing about the upcoming election - if Romney does win, he has said he already does not plan to renominate Ben Bernanke to the position of Chairman of the Fed. While there still remains a sizeable contingent of doves on the current FOMC, some traders are concerned that he would nominate someone less inclined to continue a monetary policy of perpetual bond or asset buying as their predecessor. The truth as I see it is that these bond/asset buying programs of the Federal Reserve are NO SUBSTITUTE for overdue STRUCTURAL REFORMS that must be put into place if the US economy is to begin growing at anywhere near its potential. Depending on which party gains control of the Senate, if the Republicans were to win that prize and the Presidency, I would look for an extremely ambitious agenda which will excite the business community and begin to spur economic activity. In that case, the Fed would be able to VERY SLOWLY begin reversing its bond buying program once the economy were to actually turn for the better. That of course would take time as any attempt to rapidly withdraw this mountain of excess liquidity would send a shock wave through the global finance world. If the Democrats were to hold the Senate, Mr. (everything dies in the Senate) Reid, would do his worst to thwart any needed reforms unless there was strong public support for such. In that case, the monetary pump would continue at full force with little chance of it being scaled back. I repeat, it is crucial to the long term health of the US economy, that structural reforms begin. Without those, the economy will merely limp along and the present status quo will continue meaning the constant tug-of-war between the forces of deflation and the forces of inflation will go on with the wild volatility only getting worse. One thing to also watch for will be a repeal of Obamacare if Romney does win the election. Should he make good on his promise to repeal it on day one, business will applaud and money that has been sitting around doing nothing in their accounts, will immediately be put to work. I'd like again to point out to more strength in the mining shares, this time a bit less obvious to those who don't have access to Toronto quotes. The Canadian mining shares, and the TSX overall has done very well the past few days, possibly since there's nowhere else for the money to go since the US markets were closed, and/or the recent weakness in the CAD. Or maybe it's something else. Check out the action in the last 2 days of GG (G.TO is Goldcorp, Yahoo Finance has the wrong name), EGO (ELD.TO), AEM (AEM.TO), SLW (SLW.TO), and ABX (ABX.TO). One would think with ample liquidity in the TSX version of these stocks, the usual connection between the metals and shares would still stick, but no. Very notable indeed. Dan, great market analysis. You could focus on the markets and leave politics out of it, because Romney is the founder of US socialized medicine. Romney pledges to REPLACE Obamacare with something else ... wait for it ... Romneycare. There is minimal difference between the two duopoly bankster-supported candidates. That is why many of us looked to and are voting for Gary Johnson. These stubborn bulls will flee in size IF, and I want to emphasize the "IF" part of this, support marked "INITIAL SUPPORT" does give way.